As winter has firmly descended upon us, I find this is the perfect time to hunker down in cozy, comfortable clothes (preferably yoga pants), with a warm beverage, and dive into books that I’ve intended to read, only half-read, or have loved enough to re-read. I’m thoroughly a fiction lover, and to be honest, self-help books are not really my thing, but I’m currently in the middle of exploring 3 yoga books, written by women, with a woman’s perspective, each offering a very personal perspective on the practice of yoga. The book recounts Colleen’s turbulent life, addicted to heroin at a young age, working as a globe-trotting fashion model, volunteering for Mother Theresa in India, surviving a lightning strike only to succumb to a seizure disorder (which she still suffers from), and ultimately finding peace through her yoga practice and teaching. Each chapter includes specific practices with illustrated step-by-step instructions that address issues ranging from mood swings to detoxing, grief, depression and stress that correspond to specific junctures of Colleen’s life. This is another one that I picked up from attending a yoga workshop (yes, I go to a lot of them) – this time a Restorative Yoga workshop with Jillian (at Elevate Yoga in Hazlet). Jillian’s premise is that stress is at the root of much of our fatigue, burnout, anxiety, addiction and illness. By cultivating deep listening skills, paying close attention to our body, mind and heart, we can confront our stress differently and tap into inner resources that allow us to respond calmly, clearly and wisely. Jillian was an over-achiever and initially loved yoga for its physicality, until she had her first panic attack and learned to spend more time “being” rather than “doing”. Each chapter includes a number of daily practices to engage in that serve to cultivate our deep listening skills, including contemplation, meditation, simple yoga poses, restorative postures and journaling exercises. Pick these books up if you want to learn more about yoga, want a reference guide for your home practice, or just want to hear a unique voice on the practice of yoga. Perhaps what appeals to me most about these three books, is that each of the authors came to yoga for a different reason, but they all credit yoga for having saved them in one way or another, and have drawn deeply from their own experiences to share their love of the practice. May Louie first took yoga in college to fulfill a Phys-Ed requirement and immediately fell in love. 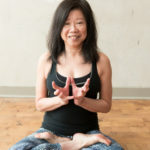 She unfortunately did not continue with her practice but reconnected with it when she retired from her corporate job in 2002 and has since become a serious yoga enthusiast. After her second retirement last year, she completed her 200 hour RYT certification, studying with Dina Crosta, Ellen Mosko and Jamie Segal Hanley, with a focus on alignment based flow.